Lawson Home & Contents Auction — Harritt Group, Inc. 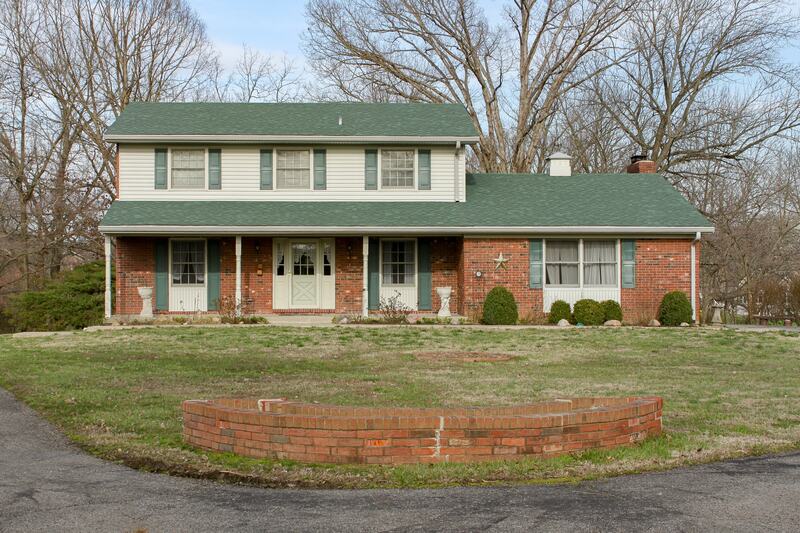 Recreational park-like setting with creek on 3+ acres in Floyd County with 1960’s two-story home, sunroom, covered porches and attached garage plus barn with loft and shed located just 2 miles NW of I-265 Charlestown Road Exit. Also selling (2) pickup trucks, gutter machine, trailers, firearms, mowers, tools, equipment, furniture, antiques & art. Beautiful 3.29 acre setting along the creek with brick 2065 square foot 2-story home plus finished walkout basement, enclosed sunroom, covered porches, attached 2-car garage, 35’x48’ concrete block barn with loft and 16’x32’ shed located just minutes from all the amenities the city has to offer. Home built in 1969 features family room with beamed ceiling, oak pegged floors, built-in bookcases & fireplace, equipped eat-in kitchen, formal dining, living room with french doors to sunroom & enclosed porch and 1/2 bath on first floor plus 4 bedrooms and 1 1/2 baths up. Finished lower level includes large laundry room with built-ins, full bath, game room, family room with fireplace and wood stove insert walkout to covered and open patios in wooded setting. Great potential and buying opportunity with plenty of area for additional garage, parking and recreational use. 2007 Chevrolet 1500 Silverado 2WD 5.3L V8 long bed regular cab pickup 59K miles and 1997 Ford F150 4WD 4.6L V8 short bed regular cab pickup truck 113K miles. Combination 5” & 6” gutter machine on Homestead 14’ enclosed tandem trailer. 14’ single axle flatbed trailer. Great Dane zero turn lawn mower with 19HP Kawasaki engine (Only sells if real estate meets reserve), (2) Craftsman push mowers, Hasty lawn vac, pull behind lawn cart, 5HP Craftsman mulcher/shredder and mini rototiller. (9) handguns including Sterling stainless .25 cal, Colt automatic .25 cal, Bersa Thunder 380 ACP, Hi-Point 380ACP, Llama Minimax45 Sub-Compact, Astra Mod. A-90 9mm Para, Canik55 S-120 9×19 Para, Ruger New Model Super Blackhawk .44 Magnum, Heritage Rough Rider .22 cal long rifle revolver, (1) Master Piece Arms 45 ACP rifle, (6) shotguns including Mossberg 500A pump 12 gauge, Mossberg 500C pump 20 gauge, Stevens Model 5N Series A 20 gauge, J.C. Higgins Model 1011 20 gauge, Wards Hercules Model SD10B 12 gauge & New England Firearms Pardner Model 410 shotgun plus Winchester Pony 30 gun safe & Cannon 24 gun safe. $20.00 Transfer Fee per firearm. NO EXCEPTIONS. Pickup at 2 Brothers, INC. 421 W. Main Street, New Albany, IN. available beginning Tuesday 4/11/17 after 3PM. Out of state purchasers of handguns will need to provide FFL dealer of choice in their home state for shipping. Kobalt vertical compressor, 7550 watt Generac generator, Craftsman portable jobsite table saw, several pressure washers, portable air compressor, torpedo heater, Fimco sprayer, several chain saws, 24’ fiberglass extension Louisville Ladder, several aluminum ladders, large amount of lumber including treated cherry, Craftsman ATV/motorcycle jack, (5) Jeep tires and wheels, large selection of power, yard and hand tools, Craftsman hand circular saw and bench grinder, 5 speed drill press, saw horses, bar clamps, many tool boxes, organizers, creeper, dollies, hardhats, locks with keys, gas cans and much more to be found in a large barn. Antique Wooten walnut flat top rotary desk, Victorian pump organ – Packard Organ Co, Fort Wayne, ornate cherry mirrored wardrobe, 8-piece maple dining room suite, Queen Anne china cabinet, antique wash stand & lamp table, jewelry chest, cedar chest, flat top trunks, sofas, chairs, 6-month old lift bed, maple chest and dresser, (2) large wood bookshelfs, 32” flatscreen TV, bistro table and stools, antique chamber chair, drafting table, director’s chair, several ornate rocking chairs, wicker chair, glider chair with foot rest, cast iron lawn furniture and much more. Gone with the Wind oil lamp, art glass lamp, iron dog nutcracker, bird dog door stop & dachshund boot scraper, carbide light, collectible roosters, iron kettle, marble game, Howard Miller mantle clock, still part, US military survival bucket, large selection of canes, bourbon barrel lids including Old Forester and Woodford Reserve, Heroes of the Old West decanters, spinning wheel, Yankee clipper sled, lard tins, retro girl’s 20” bike with banana seat, crocks and jugs, art pottery, depression, opalescence & milk glass, glass water jug, arrowheads, grindstone, pocket knives, 35mm Pentax camera and lenses, binoculars, lamps, blown glass clown figurines, native american figurine, doilies, blue mason jars, retro Barbies, Mary Kay & Michael Jackson dolls, penguin ice bucket, buttons, large selection of yard art, Zane Gray book collection and more. Ray Day framed prints including Country General Store, Mail Pouch Barn, Rock City Barn & Burma Shave Country, William Hancock print, (2) charcoal on paper railroad pieces and many other framed oil paintings. Railroad lantern lamp, railroad lanterns and oil can, large selection of Norfolk Southern railroad memorabilia, books and videos, work manuals and more. Large selection of glassware, linens, blankets, cooking ware, cell phone movie projector, coffee table books, Yale safe with combination, several living plants and more. I-265 to Charlestown Road Exit#4. North 1 mile to left on Chapel Lane. West 1 mile to auction on right. Or 1 mile East of Grant Line Road.